Computer controlled testing has helped to drive manufacturing productivity by increasing efficiency and improving quality. Automated test equipment (ATE) plays a crucial role as it enables more vigorous testing at faster rates and in a more controlled manner than was previously possible using manual procedures. ATE can involve a single measurement made continuously at very high rates or multiple measurements made by a host of different instruments. Measurements made on a device under test (DUT) or unit under test (UUT) are typically calculated, stored and analyzed in an automated fashion by some form of computer. The process helps to remove human error and allows fault diagnosis to be performed in reproducible manner even when sophisticated measurements are involved. 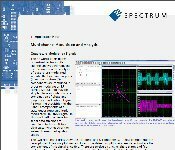 Spectrum has available an extremely wide range of digitizers and arbitrary waveform generators for ATE applications where electronic signals need to be captured, generated and analyzed . The products come in a variety of popular standards including PCI, PCIe, PXI, LXI and cPCI. The digitizers offer bandwidths from 50 kHz to 1.5 GHz, sampling rates from 100 KS/s to 5 GS/s, and resolution from 8 up to 16 bits. With the ability to catch and analyze signals from DC to 1.5 GHz the digitizers can be used to test a diverse range of DUT's and UUT's. For example, when large dynamic range and maximum sensitivity is required high-resolution 14 and 16 bit digitizers are available for the capture and analysis of signals that go as high as 250 MHz in frequency. These high-resolution products deliver outstanding signal-to-noise ratio's (up to 72 dB) and spurious free dynamic range (of up to 90 dB) so that small signal variations can be detected and analyzed. They are the perfect tools for testing precision components, sensors and systems that generate signals that need to be tightly controlled. For higher frequency measurements, such as those found on PCB boards and semiconductor devices, Spectrum's ultra-fast 5 GS/s cards make it possible to characterize signals and pulses down to the nano and sub-nanosecond ranges. To allow easy integration into ATE systems Spectrum makes available software and instrumentation drivers that work with 32 bit and 64 bit versions of Windows and Linux. Programming of the cards is possible using a wide range of languages such as LabVIEW, LabWindows/CVI, C++, MatLab, Borland Delphi, Visual Basic, VB.NET, C#, J# and IVI. Each digitizer card can have from one to sixteen channels and multiple cards can be linked together with Spectrum's StarHub system to create instruments with up to hundreds of fully synchronous channels. This makes them ideally suited to applications where multiple signals or test points are to be monitored. Some cards also offer additional analog and digital I/O capabilities as well as advanced triggering and clock options so that they can work together with a host of different test instruments. CPU based embedded systems now play an increasing part in the monitoring and control of the mechanical and electrical components in many areas of our technological environment. This artcle shows the realization of a verification tool to help reduce the cost of measuring, optimising and verifying the timing performance of critical real-time embedded systems within the avionics and automotive industries.